There are only three meaningful games left of the 2014 World Cup. Sunday sees the final being held in the Maracana in Rio, but before we get there the finalists need to be decided. Looking at the four teams involved it wouldn’t have been too difficult to predict all four semi-finalists before the tournament started. Yes, there have been some surprises along the way, but the four teams who are left have overcome all obstacles and are now just 90 minutes away from a place in the final. On Tuesday Brazil face Germany and on Wednesday it is Netherlands v Argentina. Four great teams, two epic battles, but who will triumph through to the final? B razil have reached the final mainly thanks to their fanatical home support and the performances of Neymar. And while they can always rely on a vociferous support from the stands, they will have to do without their talismanic striker. Neymar is out; an injury sustained in the Quarter Final against Columbia putting a premature end to his tournament. He has made the difference in many of Brazil’s games so far, so who will provide the inspiration in his absence? There aren’t many contenders to be honest. This has to be one of the least exciting Brazil sides in recent memory, similar to the functional, but dull side which won the World Cup in 1994. It says it all when they have to rely on two defenders getting the goals in the Quarter Finals. Germany have shown flashes of brilliance and flashes of vulnerability so far. The excellent form of Thomas Muller in the group stages seems to have dipped a bit and they too had to rely on a defender getting a goal from a set-piece to help them qualify for the semi-finals. Germany have looked more dangerous than the Brazilians though and you get the impression that while Brazil have walked something of a tight rope between success and failure at times, Germany have been firmly in control. As I’ve said before, Germany always do just enough. There is no separating the two sides in the betting with both teams a best priced 9/5 to win and the draw being 11/5. I think Germany to Win in 90 minutes is a good bet. You can get 9/5 with William Hill, Bet 365 and Ladbrokes or 8/5 with Bovada. Also appealing is Germany to Win and Both Teams to Score at 6/1 with William Hill or at 5/1 with Bovada. Soccer can be a game full of quirks of fate. Miroslav Klose is just one goal away from breaking the goalscoring record he shares with Brazil Legend, Ronaldo. Wouldn’t it be fitting if he was to do this against Brazil? He is 14/5 with Bet Victor or 9/4 with Bovada to score at any time. 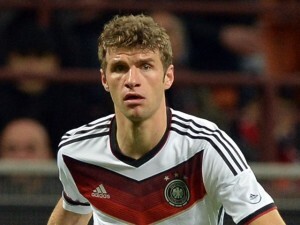 Top Bet: Germany to Win and Both Teams to Score at 6/1 (William Hill) or 5/1 (Bovada). This tie may depend on how well Netherlands have recovered from their gruelling match against Costa Rica. A dramatic penalty shoot-out saw the Dutch take the spoils after Costa Rica bravely defied them for 120 minutes of football. This ability to grind out a result is a feature hitherto unseen from Netherlands. They have been the kings of glorious failure in the past, but maybe this year they have the character to go all the way. To do this they will need to stop the best player in the world; Lionel Messi. Messi has been in top form and it’s only in the last two games that his colleagues have alleviated some of the pressure on him. Angel Di Maria and Gonzalo Higuain scored winning goals in the last 16 and Quarter Final ties, but without the injured Di Maria the weight of expectation will fall firmly back on Messi’s shoulders. This is a really tough one to call. You could put it down to how well Messi plays for Argentina and how well Robben plays for Netherlands. Argentina like to play with their full-backs high up the pitch and Robben could exploit this with his explosive pace. On the other hand, Messi may find extra space against a Dutch team electing to play with 3 defenders. I’m going to stick my neck on the line and go for a Netherlands win in extra time. This is 11/1 with William Hill and Coral or a very tempting 14/1 with Bovada. For the game to be won in extra time obviously means that it will be a draw after 90 minutes. The draw is a best priced 12/5 with Coral and BetFred or 23/10 with Bovada. If you are wanting to have a goalscorer bet, have a wager on Wesley Sneijder to score at any time at 5/1 with Coral and Paddy Power or 7/2 with Bovada. Top Bet: Netherlands to Win in Extra Time at 11/1 (William Hill) or 14/1 (Bovada).